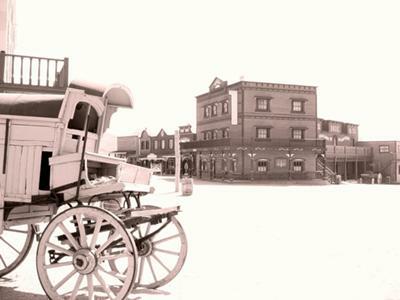 The Tabernas desert is 'Wild West' country - or, at least, it was! 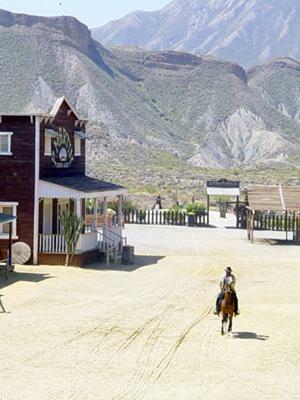 If you watched Clint Eastwood in 'A Fistful of Dollars' or 'For a Few Dollars More' to name but two of dozens of spaghetti westerns produced here or seen 'Lawrence of Arabia' you have caught glimpses of the Tabernas desert. 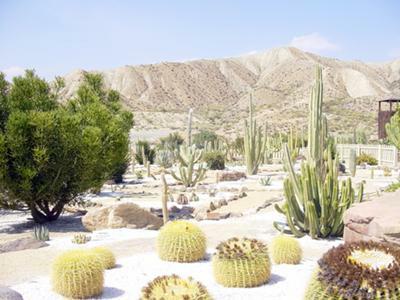 It is located a few miles from Almería, between the great rocky masses of the Sierra de los Filabres and the Sierra Alhamilla. It is a dramatic almost moonlike landscape and what plants that exist within this habitat twist and bend amongst the great cracks in the earth in search of some moisture. Salt cedar, oleander and brushwood have adapted to the conditions of extreme aridity and the local fauna mainly consists of insects, toads, hedgehogs and scorpions. A number of birds can be seen flying over the dry gullies and riverbeds including the swift, rock martin, crested lark and jackdaw. It is the only true desert in Europe. It may be a desert but I like it. The scenery is startling. The arid yellow ochre landscape contrasts with the vivid blue Almerian sky. The annual rainfall here does not exceed 250mm and the year-round average temperature is over 17 degrees. It has 3000 hours of sunlight per year, making it an ideal spot for a solar energy installation and that is why the largest centre of solar energy in Europe, the 'Solar Platform of Almería' has been installed in this area. This area used to be a giant film set - the Italian director Sergio Leone made Spaghetti westerns here in the mid 60's and there are still some original film sets scattered around but most are now in a dilapidated condition - except for 'Western Leone', 'Fort Bravo' and 'Mini Hollywood' which were rebuilt as tourist sites. When my grandson visited a couple of years ago, I took him to 'Mini Hollywood'. It was a good day out. If you ever visit this area of Spain with your children, I urge you take them to 'Mini Hollywood'. They will enjoy it. I did! This post is very impressive thanks for sharing this post. Thanks for sharing so good information i really appreciate this post. I've frequently asked why script authors feel constrained to bring freedoms with a story that is really settled, and even prone to cause rage if messed around with. best essays. It doesn't make me doubt the genuine story, as Hollywood is known for energizing any story. May I ask to do a favor for me? - I really want to publish some ads of my site Find Costume Ideas on your blog and will pay you good money! This is an awesome place and i think i should visit here atleast once with my friends and the whole team of assignment writing service cheap . With the office team we can enjoy more. Women are acceptable added appearance acquainted day-by-day due to the advance of media and the accent on celebrity appearance top replica handbags added with a lot of advertising on the artist accoutrements they sport. Most avant-garde counterfeiting is focused on cheap replica bags cardboard money, because cardboard money has a college face value. That was an awesome travel experience I love to go to this place. I do not know much about the home stay facilities. I need to refresh my mind. Because I am writing a script for my next short film. Thanks so much Robert. 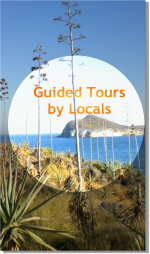 This article truly reflects what we experience each time we visit and stroll around the desert. 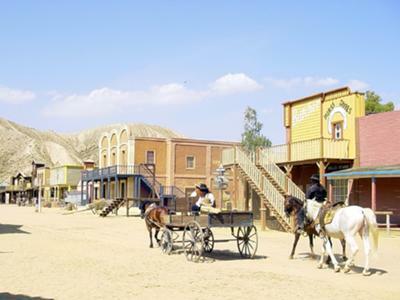 However, a few years ago, the Old Western Town formerly called Mini Hollywood was re-named and is now called Oasys Theme Park (Parque Temático Oasys) . I suppose it is to avoid confusions, since the local people used 'Mini Hollywood' to describe all 3 Western Towns. Join in and write your own page! It's easy to do. How? Simply click here to return to Oasys Theme Park Reviews.